Could a gold price of $10,000/oz. be just around the corner? It seems almost unthinkable, but with gold bears converting to bulls in ever increasing numbers, some pundits are predicting gold’s run to continue for some time yet, and possibly reach these kinds of heights. Against this backdrop, one micro-cap ASX stock, currently valued at around $10M, is building up to producing its first gold bars from its start-up mine near Kalgoorlie over the coming months. With final preparations underway for mining to commence, there is little standing in the way of this company and its first revenue targets, and production is set to commence next quarter. This stock recently successfully raised $1.26M, receiving overwhelming demand from investors – with this cash in the bank, it should take the company all the way to revenue production from mining. 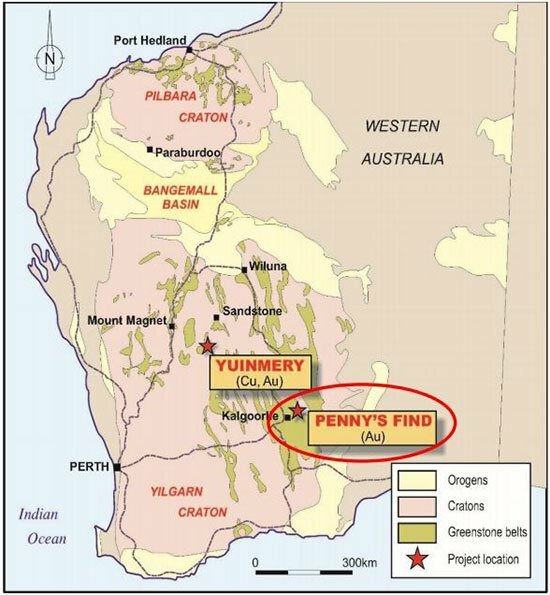 The company’s main project is the Penny’s Find Gold Project in the Eastern Goldfields, of which it has a 60% stake. Digging at the Penny’s Find Gold Project – located 50km northeast of Kalgoorlie – is set to commence in weeks and the company has completed permitting, received approval for mine development, with detailed discussions underway to debt fund the project. Due to the nature and high quality of the ore in the open-pit, 50-85% of the gold will be recovered using the gravity method, ensuring the low cost nature of the operation aligns with the company’s business model. The Penny Find’s Gold Project is expected to deliver a net return of $7.6M at a gold price of AU$1,500 p/oz. Of course this number is speculative and there is no guarantee this net return will come to fruition. If considering this stock for your portfolio, don’t base your decision solely on this numbers and please consult a professional financial advisor. Working estimates are based on a gold price of AU$1,500 p/oz., with the current price of the precious metal around all-time highs, currently at $1,782 p/oz. Assuming a gold price of $1,500/oz., project payback can be as quick as 8 months. For every $100 rise in the price of gold, $2M is added to the value of this company’s lead gold project. Calculations based on the current price of gold add $5.6M of value to the main project. Under the 21,700 oz. reserve in the open-pit is a further 29,500 oz. resource that can be mined with underground mining techniques. This company has over 100 years mining experience amongst its board and management and is adept at making high value discoveries. Its managing director has worked with major internationals such as the $23B Newmont Mining Corp and the $20B Esso and is well skilled in managing companies from exploration, to discovery and into production and profitability. That is exactly the position he intends to put today’s $10.45M capped junior in. 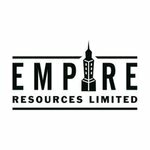 Empire Resources (ASX:ERL)’s lead project, the emerging Penny’s Find Gold Mine, is located 50km northeast of Kalgoorlie in Western Australia. Penny’s Find is owned 60% by ERL, with the remaining 40% held by the unlisted Brimstone Resources Ltd. In Penny’s Find, ERL has a probable high grade resource of 21,700 oz. of gold @ 4.62 g/t Au, with the mineralisation at Penny’s Find extending to 250m below the surface and remaining open at depth. Further exploration following open-pit mine start up is available to ERL to extend both the resource and mine life. To fund operations, ERL recently sought a capital raising via placement which was met by overwhelming demand. $1.26M was raised via the placement at $0.02 per share, with the current share price at $0.03 per share. The recent capital injection should provide ERL with enough working capital until Penny’s Find begins producing revenues on its own. A bankable feasibility study estimated $1.5M for capex for $7.6M free cash flow over the 11 month life of the open-pit mine, at a gold price of AU$1,500 p/oz. Every $100 rise in the price of gold over $1,500 p/oz adds $2M to the free cash flow value of the project. 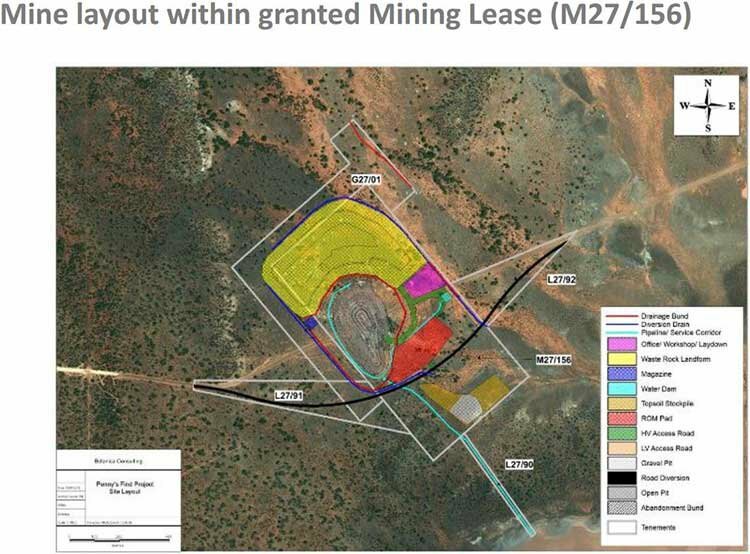 Mining approvals have been granted by the Western Australian Department of Mines and Petroleum for Penny’s Find, allowing the path to mining to be accelerated. As such, ERL is currently in the process of selecting a contractor to develop the open-pit mine at Penny’s Find. At the end of July, positive results came back from the first reverse circulation grade control drilling programme at Penny’s Find. 86 drill holes totalling 2,534m were drilled on a 10m x 10m pattern at 60 degrees along the length of the ore zone. The drilling campaign made numerous high grade gold intersections at shallow depths confirming the original geological interpretation of the site. The high grade mineralisation is hosted by quartz veins at the contact between sediments and basalt. 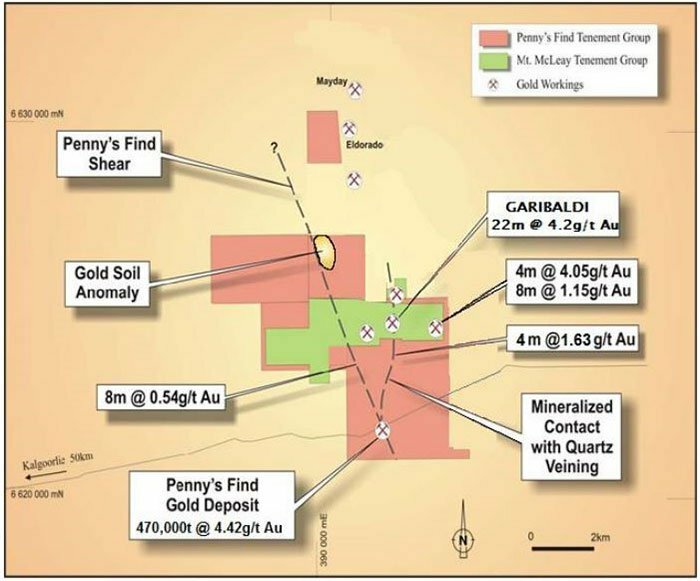 With an average open-pit grade of 4.62g/t Au to a depth of 80m, Penny’s Find presents ERL with a great opportunity to take advantage of the current high gold price. The 21,700 oz. probable reserve will have an estimated one year mine life that could be extended through further converting the underground resource into reserves. Underground mining would add two years of mine life to the already feasible one year open-pit project. With a feasibility study on the underground extension already commenced, the resource estimate is a further 29,500 oz. under the open-pit. This is still an early stage play, however, and figures may change, so apply caution to your investment if considering an investment in this stock. Both oxide and fresh mineralisation at Penny’s Find are free milling with 98% and 99% recoveries achieved in recent test work respectively. There is also a high gravity recoverable gold component, 53% for oxide and 85% for fresh. Capital expenditure (Capex) costs for the open-pit mine are around $1.5M, with the underground resource having an estimated Capex of around $5M. Included in this costing is a one off payment for rerouting the main road that runs over the Penny’s Find proposed open-pit (see in the aerial image below). Costs of retrieving the gold from the ore at Penny’s Find are relatively low due to the high grades and quality of the resource, which allows 50-85% to be recoverable using the cheap gravity method. With only a small portion of the ore requiring further treatment with reagents, ERL will be able to maximise returns by limiting costs with ore processing. Initially the ore will be treated by Golden Mile Milling which operates the Lakewood Mill located on the outskirts of Kalgoorlie, 63km from Penny’s Find. A Memorandum of Understanding has been signed with Golden Mile Milling for the toll treatment of the ore. Processing the ore will cost ERL much less than the average cost being charged elsewhere nearby (approximately $45 to $50 per tonne). This is largely due to the ore being able to be processed with the simple crush and sort method available through the gravity feed. The plant will take delivery of the ore and process the material down to saleable gold bars. These bars are then sold on to either the Perth or Kalgoorlie Mint, from which ERL receives its revenues. Due to the nature of the ore allowing for cheaper gravity processing ERL may in future build its own processing plant which would further reduce transport and processing costs. The ore processing plant is estimated to cost less than $1M and would be easily transferrable to a new site once mining at Penny’s Find is completed. The current agreement with Golden Mile Milling is non-binding and would allow for ERL to take such a course of action if it so desired. Also by using contractors ERL is able to limit costs of the operation and allow the company to forward plan its finances with greater precision. Some of the contractors being shortlisted are willing to accept payment 90 days after works have been carried out, potentially further improving the cash flow position of ERL subject to who it finally appoints. That can be leased out when not in use, bringing in additional revenues for ERL and reducing project costs. The Kurnalpi-Pinjin Road currently runs over the proposed Penny’s Find open-pit location, meaning the road needs to be rerouted before digging can commence at the site. Re-alignment of the road has already commenced and is projected to cost less than $400k, with completion expected in September. Mine development can commence immediately afterwards. As can be seen in the image below the resource will be next to the main road, further reducing operating and transport costs. It’s really all part of the ERL gameplan: low cost mining, close to infrastructure and at a time the price of gold remains high: it’s a triple play that could pan out quite profitably. Timing could not get any better for ERL with the price of gold in Australian dollars presently at all-time highs and tipped by many experts to be going higher. Economist Peter Schiff, famous for being one of the few people that predicted the 2008 crash, sees gold heading over $5,000 p/oz . If you thought that figure was astounding, Jim Rickards who also saw the GFC ahead of time sees $10,000 p/oz. gold coming in the near future. They’re not the only ones that see a bright future for the precious metal with some of the world’s wealthiest people moving into gold . Think about the significance of this increase in gold: each $100 increase over $1,500 in the price of gold per ounce could add $2m to ERL’s project. With the price of gold currently at $1,782 p/oz. there is a $5,640,000 potential increase in the cash flow of Penny’s Find. If Schiff is correct with his $5,000 p/oz. prediction, the open-cut portion of Penny’s Find alone would be worth $70M+. This should not be used as your reason to invest in ERL, but if people like Schiff and Rickards are correct as they were before 2008 then it does pose significant upside to gold producing stocks such as ERL. Sitting on the sidelines for ERL is its 100% owned Yuinmery copper/gold project, located 475km northeast of Perth, Western Australia. ERL holds several tenements that contain multiple occurrences of volcanogenic massive sulphide mineralisation including the Just Desserts deposit where a recently 2012 JORC defined inferred and indicated resource of 1,270,000 tonnes @ 1.9% % copper and 0.7 g/t gold is located. The map below locates Yuinmery in the Murchison District. Metallurgical test work indicates high recoveries of gold and copper from the Just Desserts mineralisation, keeping in line with ERL’s low operating cost model. Our observation is that revenues from the Penny’s Find gold mine could be used to get the Yuinmery Project operational in the future. ERL is a 14.7% shareholder in FYI Resources (ASX:FYI), which is seeking the discovery of shallow, high grade and large tonnage potash deposits in the largely untapped Southeast Asia market. FYI is actively focused on highly prospective potash mining projects in Thailand and Laos. With potash being essential in helping meet the current and future food demands placed on the agriculture industry, the resource is likely to see increased demand in the years ahead. The broadening of ERL’s portfolio allows the company to further de-risk itself whilst also catching any upside in relation to growing global food demands. Cashed up with $1.3M in the kitty and ready to proceed, digging at Penny’s Find is set to commence in September and ERL hopes to see its maiden revenues come in soon after. From Penny’s Find, ERL expects to generate $7.6M net return based on a gold price of $1,500 p/oz. This figure is speculative at the moment and should not form the basis of your investment decision. Please seek professional financial advice if considering this stock for your portfolio. With the price of gold currently at $1,782 p/oz. ERL looks like taking in a healthy increased margin, with every $100 over $1,500 p/oz. adding $2M value. The higher gold price provides an additional $5.64M of value to the project at present. Of course there is no guarantee on what the gold price will do in the future, however further upside would be welcomed by ERL and shareholders alike. 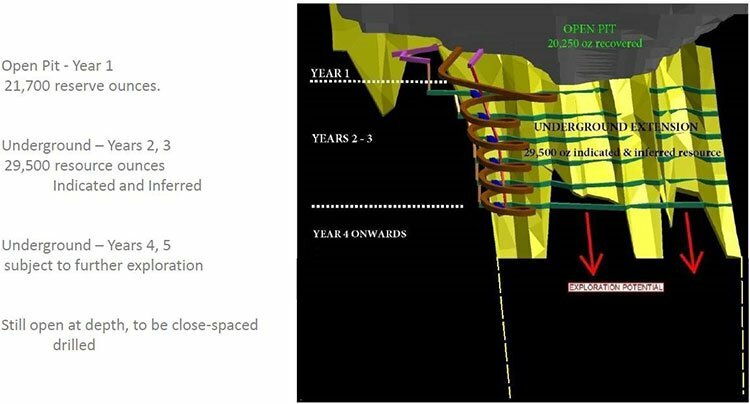 ERL is currently selecting a contractor to develop the open-pit Penny’s Find mine and ongoing feasibility studies into the underground resource offers further upside potential through exploration at depth. This bodes well for the long term future of the project extending mine life to over three years. We believe revenues from Penny’s Find could be used to develop the underground resource at Penny’s Find as well as the Yuinmery copper/gold resource. ERL’s 14.7% holding in FYI Resources also diversifies the company into the agricultural sector, allowing the soon to be gold miner to catch any upside in global food demands. Shareholders won’t have to wait much longer for gold mining to begin in the next quarter at Penny’s Find, with revenues potentially arriving soon after.